Startseite /Kontakt /Pavlenko, Tatiana, M.Sc. Tatiana Pavlenko was born in Neftekumsk, Russia, in 1990. She received the Bachelor and Master degrees in electronics and nanoelectronics from the St. Petersburg Electrotechnical University ’LETI’, St.-Petersburg, Russia and Master degree from the Faculty of Technical Physics, Lappeenranta Technical University, Lappeenranta, Finland, in 2013. 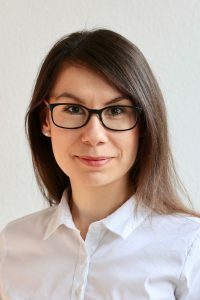 Since July 2013, she has been with the Institute of Microwaves and Photonics, University of Erlangen-Nuremberg. Her main research interests are MIMO antenna arrays for localization applications. Y. Dobrev, T. Pavlenko, J. Geiß, M. Lipka, P. Gulden and M. Vossiek, "A 24-GHz Wireless Locating System for Human–Robot Interaction", IEEE Transactions on Microwave Theory and Techniques, Februar, 2019. M. Schütz, Y. Dobrev, T. Pavlenko and M. Vossiek, "A Secondary Surveillance Radar with Miniaturized Transponders for Localization of Small-Sized UAVs in Controlled Air Space", in Proceedings of the 2018 IEEE International Workshop on Metrology for Aerospace (MetroAeroSpace), Rome, Juni, 2018. Y. Dobrev, Y. Dobrev, P. Gulden, M. Lipka, T. Pavlenko, D. Moormann and M. Vossiek, "Radar-Based High-Accuracy 3D Localization of UAVs for Landing in GNSS-Denied Environments", in Proceedings of the IEEE MTT-S Int. Conf. on Microwaves for Intelligent Mobility (ICMIM 2018), Munich, DE, 2018.